L7's highly anticipated documentary L7: Pretend We're Dead is set to be released worldwide October 13th on Blu-ray, DVD, and VOD. The film, produced by Blue Hats Creative, will also exclusively screen in select cities this fall starting September 1st. 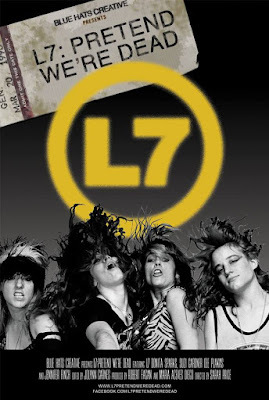 L7: Pretend We're Dead tells the story of the influential band's 20 year history and includes previously unseen raw performances, interviews, and personal home video. The documentary also features interviews with Exene Cervenka, Lydia Lunch, Joan Jett, Shirley Manson, Louise Post, Brody Dalle, Allison Robertson, and more. View the screening dates below. For more on L7: Pretend We're Dead, visit the official site here.